Last weekend for Pope Francis' historic visit to the 9th World Meeting of the Families in Ireland, two Skoda 'Rapid' cars were used at various times to assist the Holy Father during his intensive two-day programme involving different locations in the Archdiocese of Dublin, and separately in the Archdiocese of Tuam. Skoda was the official car partner to the World Meeting of Families 2018. 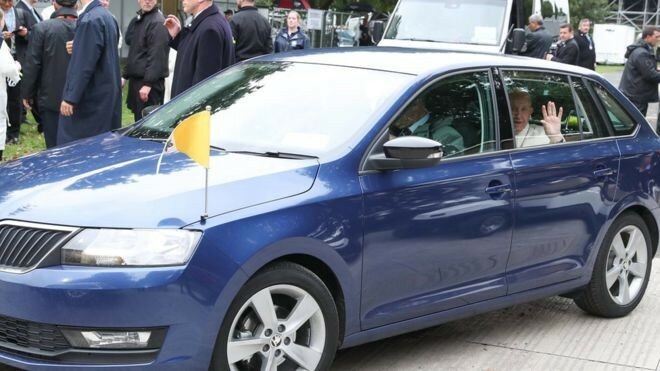 One of these Skoda cars has been given by Archbishop Diarmuid Martin, to Crosscare, the social care agency of the Archdiocese of Dublin, for use by staff in their Mater Dei homeless hub. Following a recommendation of Archbishop Eamon Martin, the other car used by Pope Francis has been offered to the Derry-based volunteer charity, Foyle Search and Rescue. On welcoming the donation to Foyle Search and Rescue Archbishop Eamon Martinsaid, "I am most appreciative to Archbishop Diarmuid Martin for this generosity regarding this gift of a car used by Pope Francis during his wonderful visit to our country. This Skoda 'Rapid' will be of great practical help to the volunteers of Foyle Search and Rescue as they undertake their brave and vital life-saving work." The chairman of Foyle Search and Rescue, Mr Stephen Twells, said, "I was speechless when I heard the good news! Foyle Search volunteers are very honoured and most appreciative to be the recipients of this very kind gift. Pope Francis' car will be provide a moral boost to our volunteers at this time, during what has been a very tough year for all of us in the city. I also aware that this gift will be a great comfort to many families here in Derry knowing that we have been recognised by the Holy Father, and by Archbishop Martin, for the work that we do." Archbishop Eamon continued, "From my time as a priest ministering in Derry, I know well at first-hand how the local Foyle Search and Rescue volunteers work selflessly, and of their own free time, each week to help those who are vulnerable and in need. The volunteers patrol the river at peak times on Thursday, Friday and Saturday nights, from 9.30pm to 3.00am, and engage with people in distress, maintain lifebelts and, critically, the volunteers save human lives. "I also wish to avail of this opportunity to commend the exemplary volunteers who provide an educational programme on water safety and suicide awareness to local schools, workplaces and community groups. In addition, Foyle Search and Rescue facilitates the North West Bereaved by Suicide Support Group which assists families and friends who have lost a loved one to suicide. May God continue to bless these local heroes in their work." It is envisaged that the blue Skoda 'Rapid' will be used by Foyle Search and Rescue volunteers as they undertake their work in patrolling the shores of the River Foyle. The car will be donated shortly, but will not possess its current number plate 'SCV 1' which represents the designationStato della Citta del Vaticano, or 'Vatican City'.